Would You Rather Get Your Water From Your City Government—or From a Corporation? Water privatization could soon be the next front in the austerity wars. In this uncertain economy, whether you think the glass is half full or half empty, you probably take for granted the fact you can fill it by turning on the tap. Last summer, that basic service vanished for Detroit’s working-class households: neighborhoods awoke to the humiliating reality that in the world’s richest nation, this impoverished city’s water had run dry—the city’s stopgap “emergency” response to fiscal collapse. 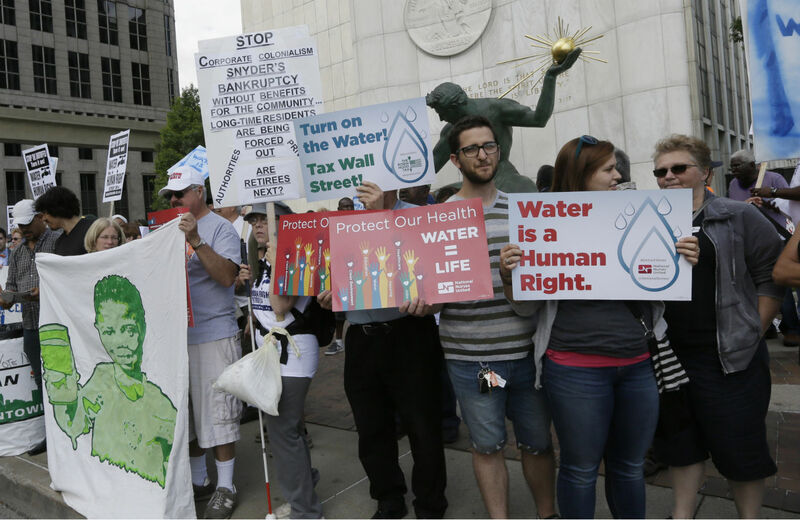 Detroit’s devastation seems freakish, but we may soon see more resource crises nationwide if pro-business officials decide water isn’t so much an essential entitlement as a commodity to be traded like corn and crude oil. According to research by Corporate Accountability International (CAI), the experience of dozens of communities that have experimented with privatizing their water infrastructures illustrates the danger of prioritizing cost concerns over human rights. Private water corporations frame water in business terms, placing economic outcomes over social objectives, preventing prioritization of the poor and vulnerable. Treating water as a mere commodity also relegates it to the whims of the market and bypasses the accountability and transparency of the public sector. Until now, much of the anti-privatization advocacy has centered on the Global South. For example, in regions of India and the Philippines, neoliberal foreign investment combined with impoverished infrastructure has led to a World Bank water scheme that CAI blames for high costs, constraints on access, polluted water and failing infrastructure. Advocates stress that historically, water infrastructure has been controlled by public authorities and, while the system is certainly not perfect, public finance has allowed for steady extension and modernization of urban water infrastructure. And this was done under the oversight of public officials, not CEOs who by definition prioritize the interests of moneyed shareholders over those of taxpayers and voters. But in recent years, water companies have been giving a hard sell to US lawmakers. As with many privatization schemes, the entry of private companies is often sold as an “innovation.” The industry has rebuffed accusations of privatization, sometimes arguing they have simply contracted to provide services or consultation with the city. Just as charter schools promise magical performance-boosting reforms for public education systems, water companies promote public-private partnerships as a win-win for the public and business, by streamlining management and slashing red tape to cope with massive underfunding of water infrastructure. Private water corporations have a fiduciary obligation to maximize returns to shareholders. To meet this obligation, they focus on a) weakening their greatest competitor, the public water sector, b) opening up the water market and creating business opportunities for themselves, and c) removing as many obstacles as possible to the profitability of their operations. And there’s another way that privatization can undermine a community: municipal water systems run by civil servants are one of the last bastions of public-sector unionism in the country. The workers of AFSCME Local 207, which handles Detroit’s Water and Sewerage Department, have fiercely protested possible privatization as they try unsuccessfully to resist city officials’ attempts to unravel union contracts as part of the financial overhaul. From the standpoint of a capitalist perspective, who wouldn’t want the water department? They figure they can triple the water bills and people will have to pay it. It’s like liquid gold.… Privatization has been a long-term process and they are finally getting their people in place to put it together. The water shutdown in Detroit was a haunting portent of what could happen when a city government is so concerned about “cost cutting,” it is willing to let its communities go thirsty. Even in a “wealthy” country, critical social institutions can make easy prey for the free market’s monstrous appetite.